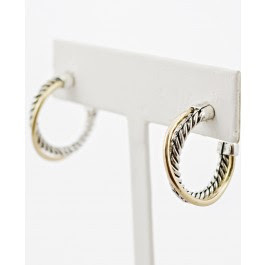 David Yurman's classic X hoop earrings retail for $695 at Saks Fifth Avenue. Check out this great look 4 less from Mimi's The Look 4 Less. They retail for an extremely affordable $10 (while you're at it, these would make a great Christmas gift for a friend or sister!) and you can click HERE to purchase.